TTTM’s Moon Chair is made from the highest quality parachute fabric (100% nylon). 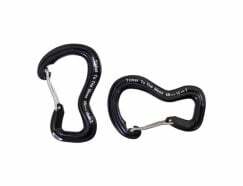 Safe and secure, now comes with a carabiner and rope to install directly. For young dreamers up to 12 years. As a travel swing, to play or to rest, the TTTM. Mini Moonchair makes for a great gift! Don’t want to use plastic bags? Use a traveling backpack! 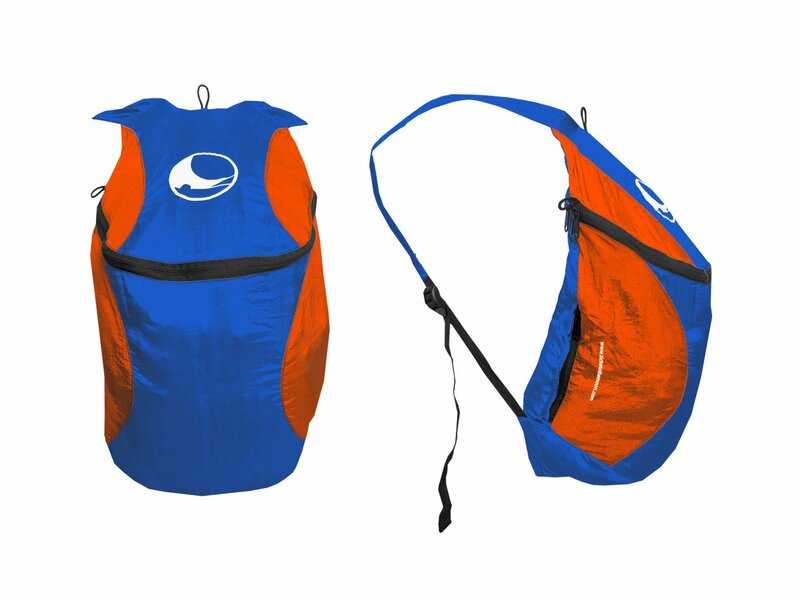 Foldable, compact, reusable, super strong & super light. 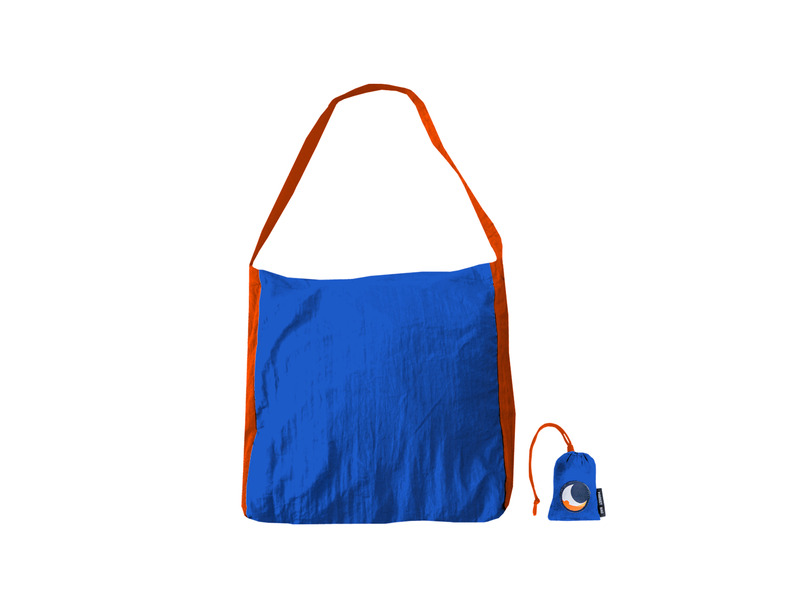 The Supermarket bag is suitable for family shopping, laundry, toys, and anything else you would usually use plastic for. New design! One more useful thing made from the off cuts of Ticket To The Moon hammocks to avoid waste in our factory - the Keyring Bag. 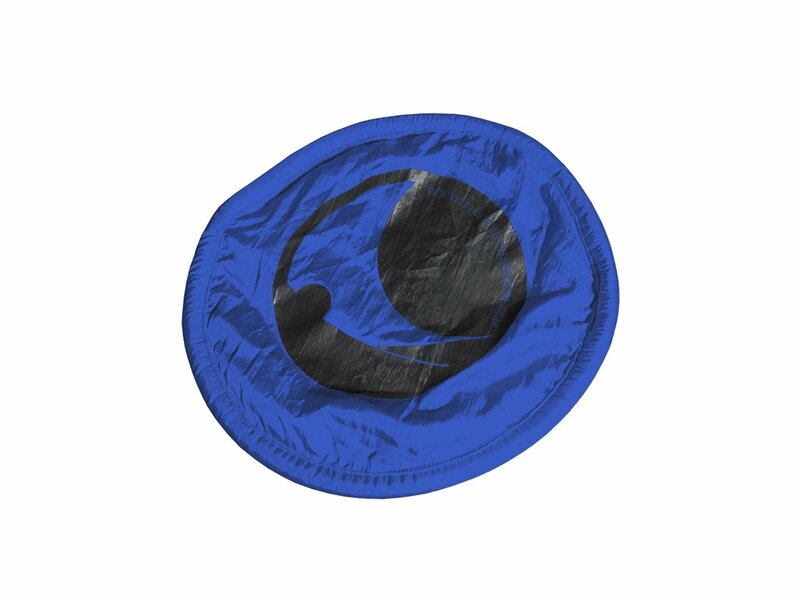 The Moontarp flysheet is the perfect accessory when it is raining or when the sun is shining too brightly. 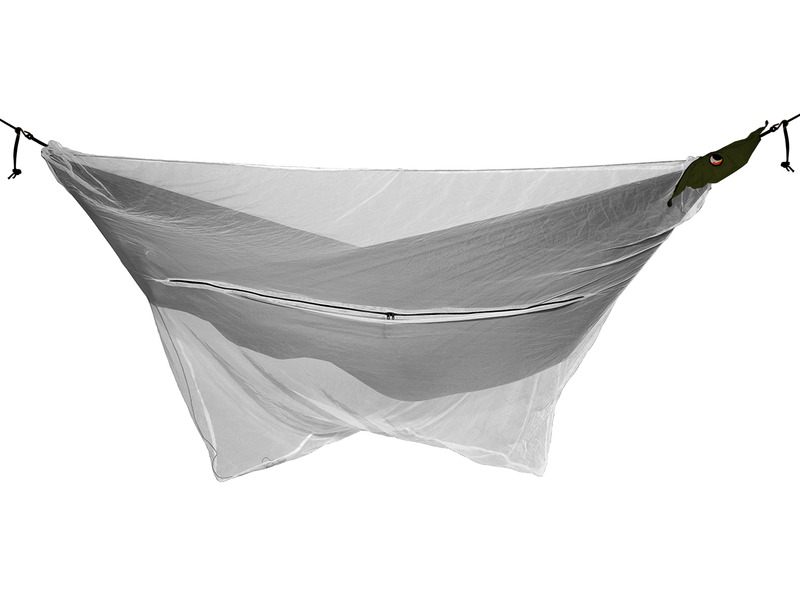 The Ticket To The Moon Mosquito Net 360° was designed for a blissful mosquito-free sleep. Say farewell to all the pests! 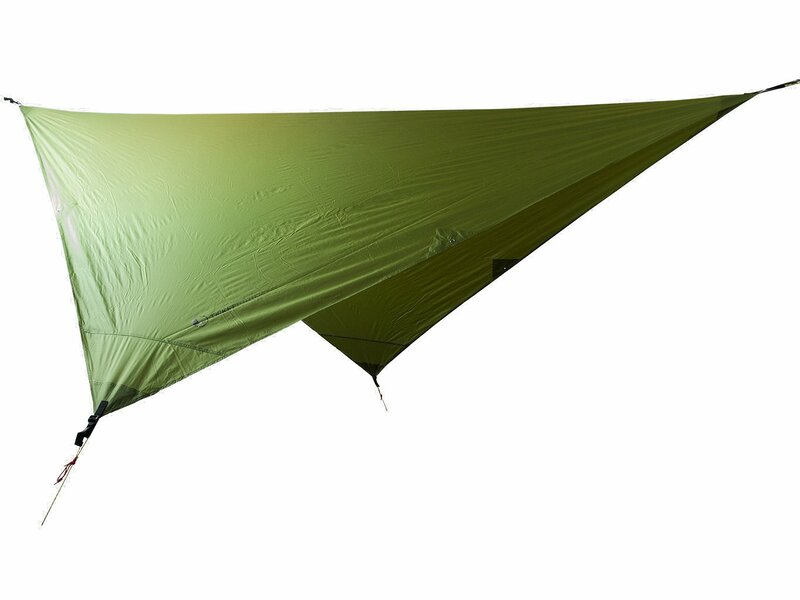 The Moonquilt gives you warmth from below, while allowing you to move freely in your hammock. Hammocks only belong onto trees? Not really! 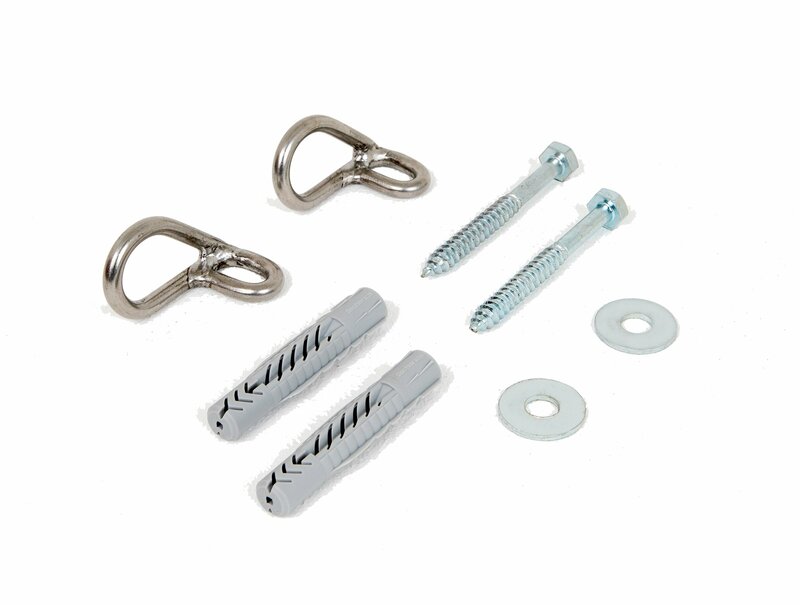 The TTTM Hanging Kit allows you to set up your hammock indoors or anywhere else you find concrete, wooden or stone walls. 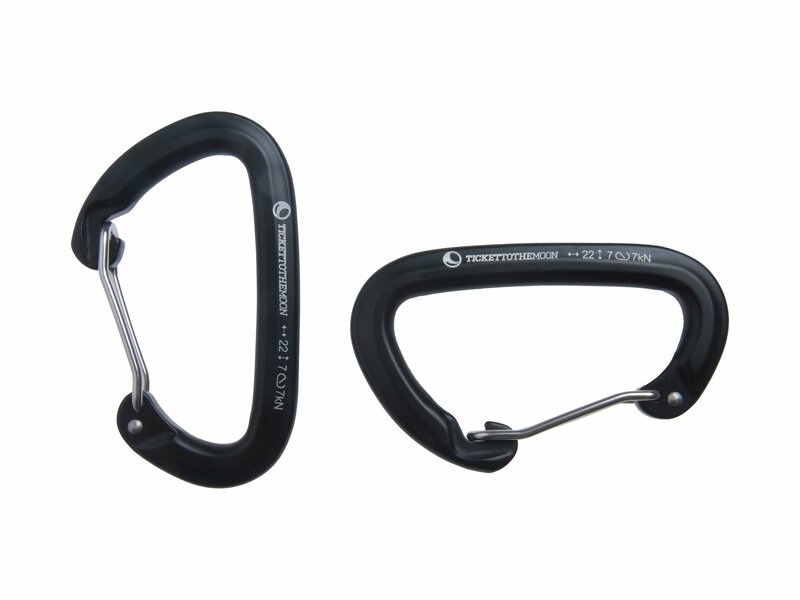 Ticket To The Moon has developed a stronger carabiner for heavy loads: the climbing rated carabiner with 22kN. The Pocket Frisbee created by Ticket To The Moon is the ultimate toy for all ages: easy to throw and to take wherever you go. 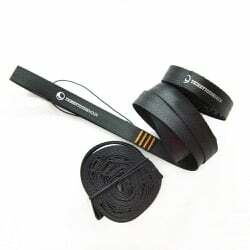 The TTTM Slackline was made the easy way for every-day use and comes with a traditional slackline installation set-up with modern conveniences. Greatness of Nature is Meant When Shared, and Your Double Hammock is, Too. Double hammock is your hero when you are about to explore the wild. To be open in the raw nature once again. Away from the hustle and bustle of the busy cities, there’s a quiet place in the backcountry where the sounds of buzzing monitors and nosy cars cannot reach you. It’s deep inside the rarely touched terrain, and only calm simplicities of nature envelop the surrounding. Peace and stillness hang in the air. All you can hear are just the rustling leaves and whispers of animals echoed in the forest. When your head feels too cramped, it’s time to pack your backpacking hammock and go into the wilderness. The trek to get there might be hard, but what you get until you arrive in the wild is very rewarding. Spend some quiet time in the rural outdoor, and soon you’ll find that this is the best way to give your body and mind an undisturbed space you really need. Whether it’s deep inside the woods or in the lakeside surrounded by mountains, everyone has their own location to feel connected with the mother earth. Pick up your own favorite camping destination and spread that portable folding hammock to spend the night. Your long hike is best rewarded with a rest between the amazing landscape in the middle of nowhere. Spending the night nicely snuggled inside the warmth of your hammock, a life far in the city now feels so far and unreal. And the morning could never be been better. Back in the city, you might remember how hard it is to wake up in the morning, especially when you need to prepare for work and take the commute. But waking up after a deep sleep in the best backpacking hammock, surrounded by fresh air and dew in the grasses surely is the best way to start the day. So good that you would wish that all Monday start like this. Have you ever feel the struggle to keep your body warmth during a tent camping? Anyone who has done much tent camping knows how cold the ground is, and the temperature can drop even more when it’s damp and moist. That’s not before you realize that the twigs and rocks are there, trying to peak your back from beneath. And that’s how the best camping system is reinvented among the explorers. It’s about floating between the air. Suspended among the trees, a backpacking hammock prevent your body to make direct contact with the cold, uneven, and sometimes unforgiving ground. Tent camping has enjoyed its glory in the past centuries. With adventurers report its good and drawbacks each after they are coming from the wild, the popularity of tent camping slowly slides off, and hammock camping begins to be more and more spotted around the woods. Your back will also thank you to the portable folding hammock you carry. 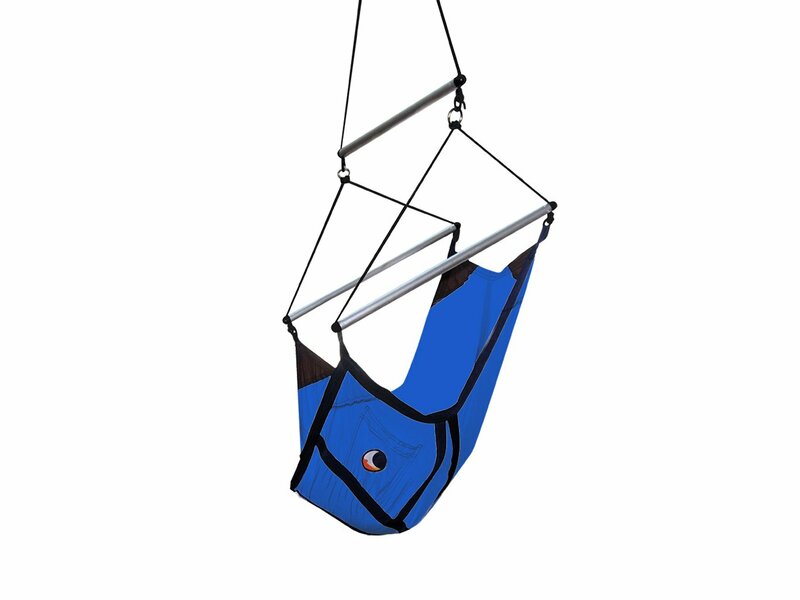 Parachute hammock, the best material for hammock camping, is very lightweight compared to a tent. It can be rolled into just a size of a grapefruit and weigh half a kilogram—that’s less than your 1-liter water bottle! There’s nothing lighter than a portable folding hammock when it’s come to camping. Rather than a set of heavy metal poles to set it up, a hammock only needs a pair of tree straps and two carabiners to hook the hammock to the straps. 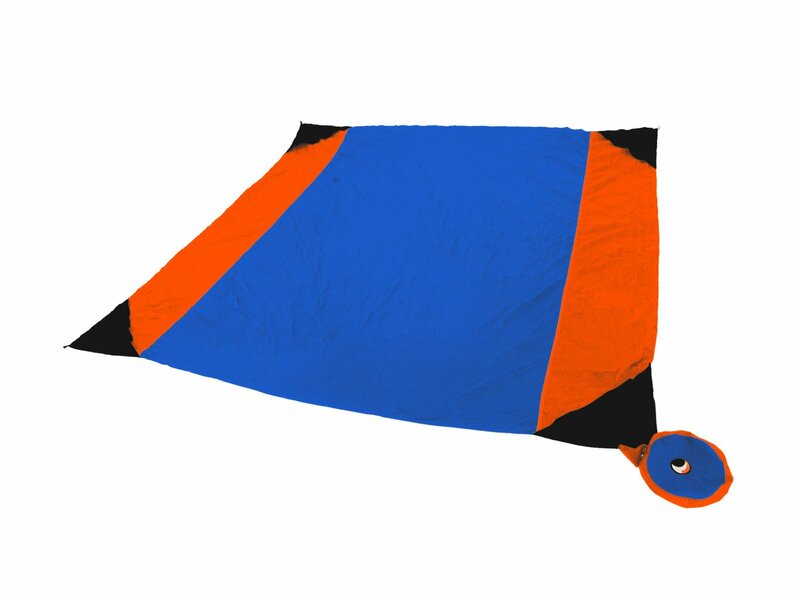 Other hammock accessories such as guy-lines, tarps, mosquito net, to under quilt can be selected according to your needs. The simplicity of a backpacking hammock allows minimum effort and time for setting up when you compare it to a tent. But it’s the Bali-based hammock maker Ticket to The Moon that brings the setup game to the next level. The bag, cunningly replicates the shape of the hammock, was cleverly designed to feature the “express setting” function for a total effortless setup. 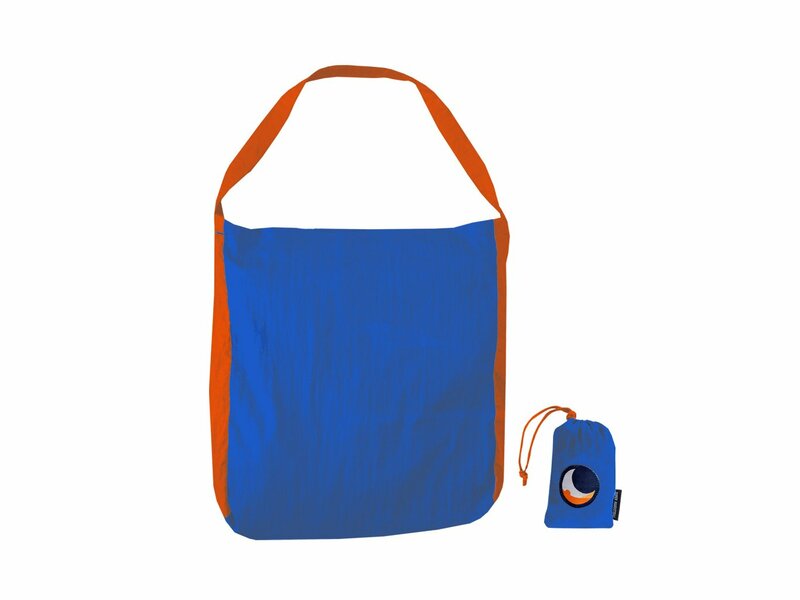 The hammock bag is sewn in a way that allows hooks of the hammock to pass through a hole in the opposite side of the zipper. Once you have set the tree straps, you only need to connect that hook to the straps and unzip the bag on the other side. 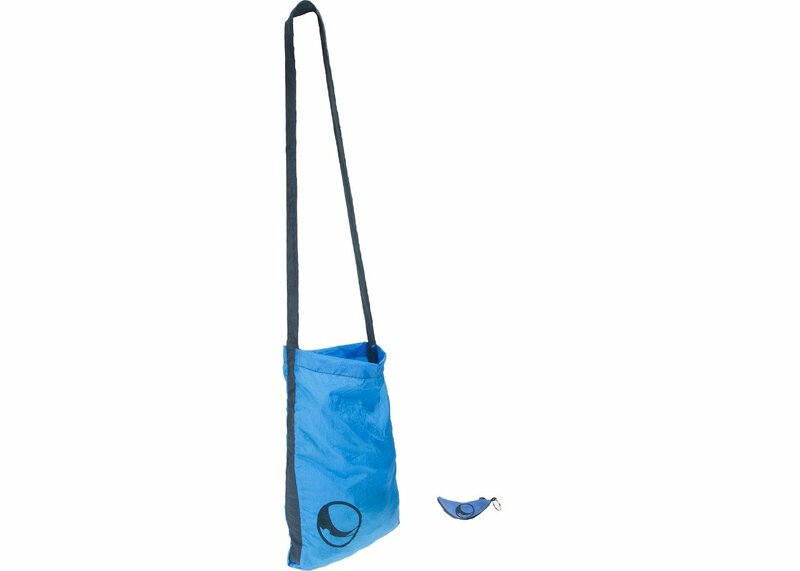 It literally only need few seconds to just start completely pulling out the hammock fabric from its bag and attach the other hook to the other strap. And your hammock is ready in a blink of an eye! Do you know what’s the other benefit of rolling out your backpacking hammock from the bag straight to the hook? That means your hammock will never touch the ground during the setup and taking down, and that’s pretty important when the camping ground is wet and moist. The single hammock is popular among travelers junkie who constantly strives for the lightest gear out there. It’s lightweight and very compact when it’s packed down, you can really just slip it to your backpack among other bulkier gears. 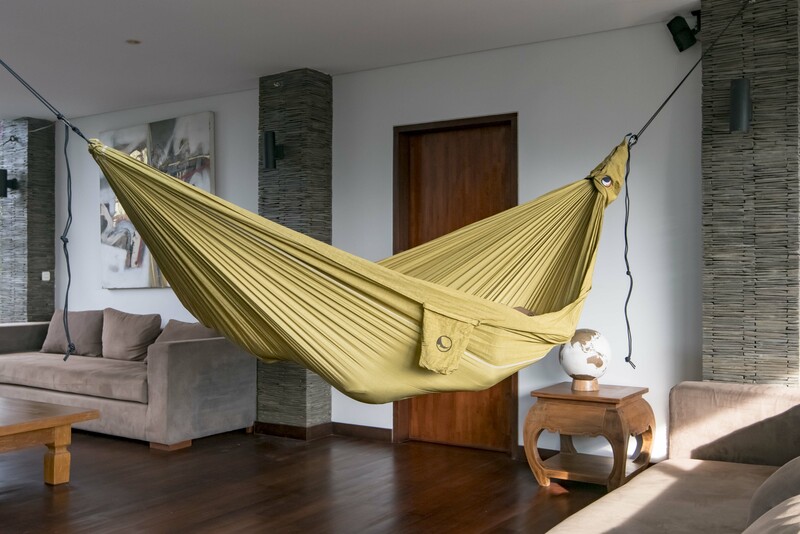 Literally living up to its name, this one-person-fit hammock perfectly fit the body of a single user, but the size restriction means you have little to no space to spare. 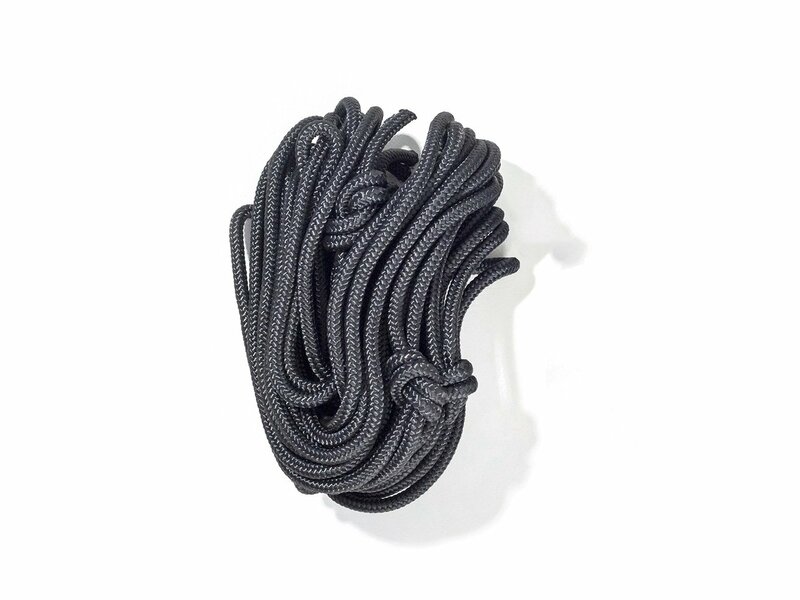 It’s a perfect choice if you want a quick-to-access, ultralight backpacking hammock to bring for a leisure afternoon on the beach or a short trips to nearby woods. Some seasoned hammock campers, though, don't really recommend using the single type for a long-term, heavy-duty hammock camping. Especially when you haven't purchased an under quilt or sleeping pad as a mean of insulation. This means you will stick to the old sleeping bag inside the hammock, which will likely take up all the space you have left. Except you are okay with being stuffed in a confined space, you might wish to take a bigger hammock for a camp like this. 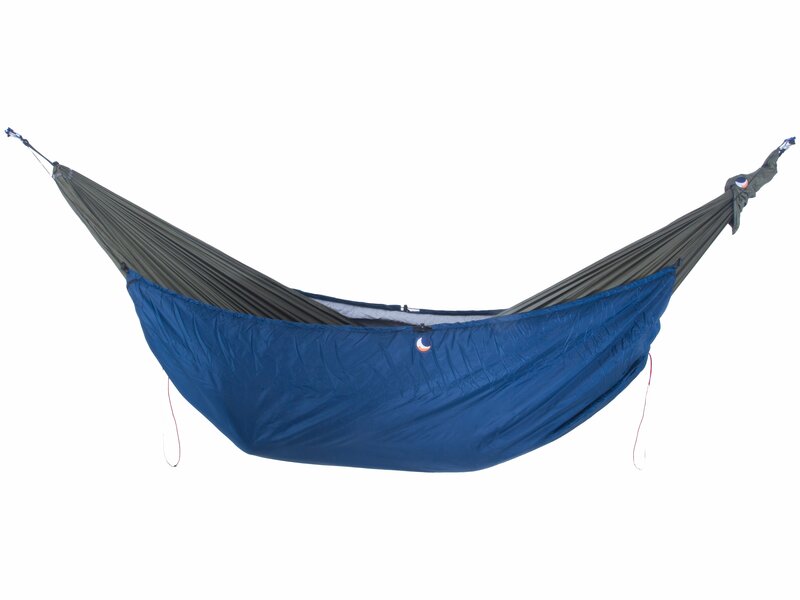 The single hammock is great for lighter users (weigh less than 200 lbs) and shorter users (less than 6 feet) wanting a hammock that will perfectly fit them. You’ll get wrapped up perfectly, almost burrito-style, without sagging too much as you will in a wider hammock. Yet if you are bulkier than that, buddy you might want to opt for the double version. If you are intended to share a lounging session in a hammock with your travel buddies, you should take a look to the double hammock. When you are willing to compromise comfort with weighing, a double hammock will feel so right. Especially when you are blessed with long legs or broad shoulders, where single hammock—though it’s strong and super light—sometimes will squeeze your shoulders a little too tight or left your feet hanging in the air. This is when you will want a longer hammock to accommodate your body. With extra feet of the fabric, a double hammock means there’s extra room for your whole body to lie down and do whatever sleeping maneuver you want without feeling claustrophobic. The two-person hammock allows taller people to lie diagonally on their hammock, which may be a little difficult when it comes to the single type. Needless to say, this is the best position to lie down in a hammock as it gives you a flat surface that conforms your body without pressure points. Without any size restriction, you don't have to sleep in a particular position to get comfy. And yes, that includes the side sleeper too! It’s downright best experience for single campers in the taller side who wants perfect body coverage from head to toe plus extra room for themselves. The double hammock is not suggested, however, for solo hammock campers under 5 feet. Tons of extra fabric around you might feel overwhelming, like being drowned in the sea of nylon. And when you are sleeping vertically a.k.a on the banana position, the gravitation will cause your body to sag deeper than you would normally like. This will make the extra flapping fabric to envelopes your upper body—almost entirely—and might trigger a little claustrophobic feeling. Unless you are taking a partner along with you, it might best to stick with the single type. Let’s be honest. While it’s thrilling to embark on solo exploration, sometimes you wish that your loved partner is here so you can share the breathtaking landscape with them. To take your cherished someone to a place where the internet signal is weak, but the connection between you is strong. With a partner, camping can be so much fun. You have someone to share the luggage (talking about working as a team! ), exploring the unknown terrain, or sharing stories around the campfire. The raging solitude never feels so intimidating again. And who doesn't want to spend a slow weekend like this? Taking an escape to the beauty of bare nature with only you, your partner, and the double hammock for you two. Add amazing scenery to the background, and your weekend will be complete. Picture this. After pouring your energy from the trekking, it’s time to set up your backpacking hammock and lounge together with your camping sweetheart, sitting there and admiring the wonderful dusk where the golden sunlight falls to the surrounding landscape. And when the night falls, it’s time to slip into the hammock and into your lover's arms, overlooking the stare until the chill air sweep you to sleep. You can rely on your double hammock at a moment like this. Just as the name suggests, a double hammock can support the weight of two persons just fine. 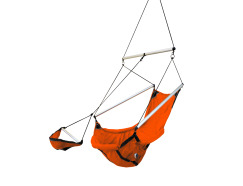 Ticket to The Moon’s double hammock is made from nylon parachute and is about 10.5 x 6.6 inches when unfolded. 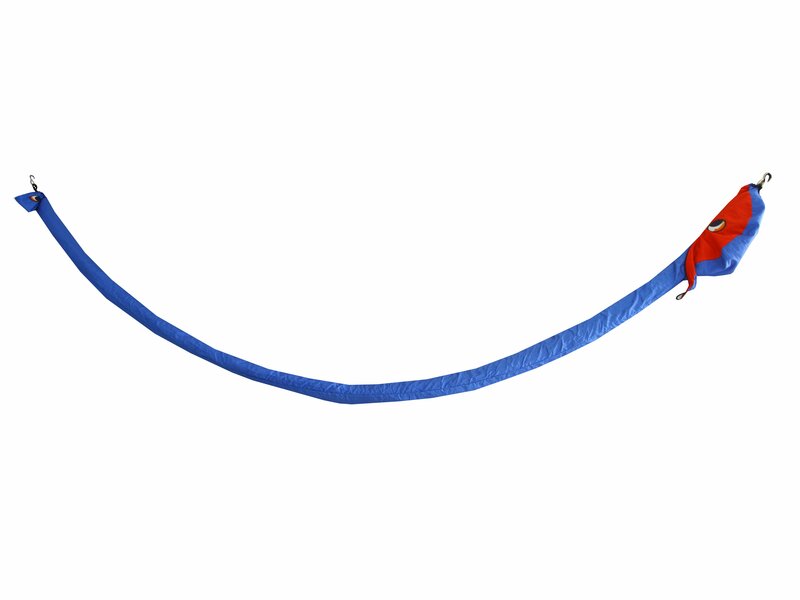 Stretched out, it can hold up to 440 lbs (200kg) easily. That being said, it’s more than enough to sit together without fearing that your bottoms will get squashed to the ground. Sleeping for Two in A Portable Folding Hammock: Is It Even Possible? Admit it, this is what you think when you hear about Double Hammock. Actually, there are two ways of camping when it involves backpacking hammock and a pair of outdoor adventurer. It’s about sleeping separately in closely hung hammocks or spending the night in one extra double, jumbo hammock. The answer depends on your level of comfort. Crashing together in one hammock inside a Single type is obviously out of the question, therefore double hammock is a default when you are taking a plus one. It’s totally great to sit together, crashing around, even for short napping during the days. When it’s time to get the actual sleep, however, it can be totally a different story. If both of you are on the smaller frame, you might encounter little to no difficulties snuggling up together in your little cocoon. However, when one or both of you are on the heavier or taller side, you might end up with squished, with her mostly squashed beneath you, or him getting your knee in his groin, or somebody has an elbow in their face. This is why some people love to maintain their own individual spaces when it’s time to tuck in for the night. If you love to take advantage of undisturbed space in your portable folding hammock but still being close to each other, then this kind of setup might be for you. Under the same tarp, hung your hammocks just next to each other under the same tarp. Another alternative, you can share the same tree and hang the hammocks in the top of another, bunk bed style. But what if you really want to try sleeping in the same hammock with your partner? Is it even doable? Lots of traveler couples seek the opportunity to sleep together in a double hammock cause, romantic reasons aside, snuggling together allows body heat transfers that you will really need during the cold night. If you are keen to share your hanging sleeping system with your travel companion, the usual double hammock might not be enough. Rest assured my friends, cause there’s still a huge chance for you to experience a fulfilling, hammock-sharing camp without sacrificing your comfort. Have a good look to Ticket to The Moon’s upgraded version of the double hammock; the King Size, The Perfect, and finally the family sweetheart, XXL Mammock which can comfortably hold up to three adults inside without compromising your camping style. Spread between the trees, the King Size hammock stretch for 26' 2" long and 9' 8” in width, hook to hook. It’s just made perfect for couples who want to enjoy the outdoors together without any limitation. It’s one foot different in width with the regular Double that makes the difference. It’s so wide and roomy it even allows two dudes to lie diagonally, five feet apart from each other. Tons of extra fabric will wrap both of your shoulders nicely. Dude, this hammock deserve a real shoot. Though it’s heavier than a portable folding hammock you usually go backpack with, it’s still far lighter than a tent for two. Ticket to The Moon’s King Hammock weighs about 1.5 lbs, while the best lightweight tent for two usually weighs 2 lbs and more, even without the poles. The King Size hammock can hold up to 440 pounds, so you don't have to worry even when you want to toss your sleeping bags with you. Though it sounds romantic and fun, camping for two in one hammock is not for everyone. But when it’s viable (read: both of you and your partner can sleep comfortably sharing a hammock), it really helps to cut down the baggage. You can heartfeltly say goodbye to the space-eater air mattress, the 3 - 4 lbs tent and poles, and a bag of stakes that always give extra pounds to your already-heavy backpack. When you are camping with a tent, there’s even no space left to dream about light camping. But with lightweight hammock, whether it’s with two singles or one extra double, super lightweight camping is now finally achievable. 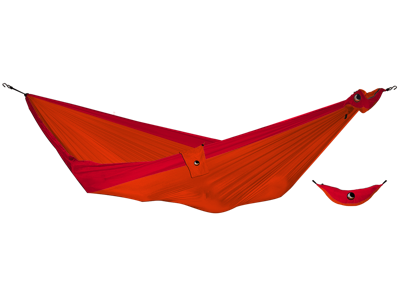 Now that we have mentioned the larger type of double hammock, aren't you curious about its possibilities? Yes, it’s about taking the whole pack of the family to the great outdoors. TTTM’s XL and XXL version of the double hammock (the Perfect & the Mammock) is a family sweetheart. It’s made for a group enjoyment in mind. This means support for you, your camping partner, comfort, and stability rolled into one. When you are an adventure-loving parent, it’s natural if you want to introduce the little ones to the calming wonder of nature. Taking a break from tablets, laptops, and those never-ending online games, camping is great for the kids to interact directly with all natural elements in the wild. They can wash their face in the nearby stream, observe little insect around the trees, and breathe fresher air. Simply being in the outdoors widens up their perception of the world, and isn’t that what all parents want? Surely, tent camping can accommodate everyone under one roof and gives the sense of warmth being in very close proximity. But it’s not the most practical. Tucking the whole family in a tent means you need that monster tent (or at least two large tents) and little to no individual space for everyone. And obviously, with bigger tents come heavier luggage. With all the kiddos running, more food supplies to carry, and a lot more little toothbrushes and other kids equipment to bring with, you will want to compress the weight as light as possible. And that is very achievable with some pairs of the best portable folding hammock to bring into the backcountry. Not only it saves you from 4 lbs tents (and multiply that into 2 - 3 times! ), it also significantly cut down the set up time as you would do with tents. As one hammock require 10 minutes setting up at most, you can put more of your time watching the kids and preparing their camping needs. It can even get a lot faster when you are using TTTM’s express setting bag feature. While the tent is greatly loveable for house play and playing pretends, hammock is the absolute playground. It’s a swing, a flying castle, a rollercoaster, a trampoline, and a burrito rolled into one. The kids will scream with all happiness in their lung. And the best part is, everyone can get their own hanging bed. You can even entrust the older kids to carry their own hammock and sleeping bag (means less luggage for the parents!) without having to worry that it will be a burden for their little shoulders. Can you imagine to give everyone in the pack an equal room with tent camping? Hmmm not so much, unless you are willing to carry at least 3 tents at once. Which will leave you with sore back even before the end of the camp. While you are going all out with the foldable hammock for camping with the whole families, you might need one King Size or Perfect Size hammock that will be enough for everyone lounging together in the daytime (plus sleeping with the youngest toddler in the family for the night), a double hammock for the Daddy, and some singles or kid-size travel hammock for the kiddos. To appeal their interest further, you can buy the kids some brightly colored hammocks to make their experience much more unforgettable. Luckily, you can fully customize your own parachute hammock at Ticket to The Moon website and choose your own hammock accessories that will come in one package. Involve the kiddos and let them express their personality. This way they will feel more attached to their own portable hammock and make the camping time much more enjoyable. As falling and stumbling are bound to happen, you can minimize the damage by hanging the backpacking hammock low to the ground. Adding bug nets with zipper, just like what Ticket to The Moon has, is great to keep the bugs away as well as keep the hammock stay in its place, even when the kids are rolling in their sleep. The zipper allows easier access in and out of the hammock. Kids love to be close to each other—they feel it safer this way. Actually, it’s very important for parents as well to keep in close distance with the kiddos even though they are sleeping separately. You need to check their insulation and be ready any minutes in time of emergency (a.k.a the bathroom trip). To stay close, hang all hammocks in one tarp. The tarp will protect all family members from rain, harsh winds, or the monsters in the outdoors. You can set two hammocks in two adjoining trees and gather the end to one tree together, stacking them side by side in a row, or put one on top of another. Hanging the hammock in bunk bed style—with your kids on top of you—is great to provide a sense of security. They can use you as a wobbly ladder to climb up to their space, and it’s easier for you to help them climb down from their hammock for a bathroom trip without even getting out from your own hammock. After a cheery night around the campfire, a box of burnt marshmallows, and a solid one-hour of stargazing that you cannot do back in the city, the idea of climbing back to their own floating bed between the trees and the dark night can be daunting for the little kids. Sometimes, it can be scary for the kids to sleep entirely in different hammocks, especially when it is their first time. The openness to bare nature in hammock camping that the adult loves might turn the kids to feel vulnerable against the darkness. What if the monsters suddenly pop out behind the looming trees and catch them in the sleep? It feels best to snug into the warmth of their loving parent’s hammock until they are ready to climb up to their own. Just like baby birds. At this time, you know you need the best double hammock that will be strong enough and wide enough to let all of the kids crawling in with Mummy and Daddy. You can rely on Ticket to The Moon’s Perfect size hammock (16' 4" X 9' 8”), which can support up to 772 lbs body weight, as the great lounge to snuggle together before the bedtime really comes. And while the older kids can spend the night in their own sleeping quarter, sometimes it’s best for the younger one to stay in the same hammock with one of the parents. Especially for the toddlers who are just having their first camp in the outdoors. This time, you will thank yourself again for opting the extra large TTTM’s Perfect hammock for the night out. Having a lot of extra space means you can hug the youngest one safely for the night without having to worry about squeezing the baby. Toddler tends to roll around (literally) during their sleep, and you can sleep peacefully knowing that s/he has plenty of room to do so. Needless to say, backpacking hammock can totally change your way of camping, even when it involves your other half or even the whole pack of the family. Before this, people commonly assume that hammock is solely made for solo enjoyment, when actually double hammock exist. Now, it’s time to share your joy of adventure and being in the middle of the wilderness with the ones you love. Take the best portable double hammock with you, and you are ready to go.